You may have noticed that I have been quiet lately. There were two main causes for this. First, I had to deal with some personal issues (yes, again) which are still ongoing – actually, a person I love is having health problems, which is of course affecting me and my time since taking care of him is a priority. Secondly, I have recently decided to create another blog apart from this one – which is totally dedicated to Travelling. Do not misunderstand me, I love this blog. It has been a place to vent and share experiences for over eight years BUT to be fair, it has also become a many-tentacled monster, tackling so many different categories and subjects that things were becoming too chaotic. This is why I decided to de-clutter a bit. I will continue to use this space to write personal stuff, such as opinion and lifestyle pieces, book and movie reviews, and articles about my own country – Malta, while having another blog to deal with my travel experiences and tips (of which I have many). I hope there is no confusion, even though I admit that at the moment some things seem to be all over the place. The ‘Travel’ section of this blog is still there, yet slowly, I will start shifting articles about travelling from this blog to the new one, and then deleting the ‘Travel’ section from this site altogether. The Travel blog – Meandering Moonsong – is still in its infancy, but I am very very proud of it and happy to be starting on this new venture. I would be happy if you could join me for this journey and follow my new blog too. Please take a look at it by clicking the link above. I hope you like it as much as I love to travel! Let’s go adventuring! I must admit, this year has been a real roller-coaster, with dizzy ups and crushing downs. Cramming it all into a blogpost is impossible to say the least, so I won’t even try. Many things are personal too, meaning that I do not feel that a public blogpost is the place to share them. What I have just realized, is that although it was a very tough year, I am infinitely grateful for it. First of all because getting through all that, has left me a stronger and more resolute person than I was before. I know who I am, I know what I want, and I also know what is worth spending time on in this short and evanescent life, and what is not. Secondly, I am grateful for my soulmate, who has stood by me, helped me, and showed me his love and devotion through thick and thin. Especially since, he himself, like me, was going through (and still is) a number of health issues as well, so we both helped each other and continue to do so. This, of course, could not but deepen and strengthen our relationship even more. Thirdly – after facing chronic pain, the inability to walk, and also acute episodes of depression and anxiety, I am more aware of what people with unavoidable conditions have to suffer… at least in part. I am also more appreciative and grateful for life in general. For being able to enjoy it. And for now being able to experience each and every moment free of pain. To be fair, I still have relapses, my muscles are not healthy yet and I cannot do certain physical activities, however this should be temporary and even if it was not, compared to my past problems, it is a breath of fresh air for sure. And last, but not the least, through illness, pain, financial issues, and material tribulations, I am very happy to say that this year I still managed to visit a total of six different countries! Travel is one of my passions, and being able to take a break and explore some of the most beautiful places in Europe sure kept me going throughout it all! During 2018, I traveled to Tuscany, France, Sicily, Ireland (these last two are two of my favorite places to visit and in fact I already have been there multiple times), the Czech Republic and Germany. There are big plans fermenting for 2019 too! Have you ever fantasised about poisoning someone? Be honest. Well, if you have, you will, perhaps, feel a little less ashamed in knowing that you are not the only one. Testament to this is the notorious ‘Poison Garden’ sprawling, beautiful and deadly, right in the middle of the gardens at Alnwick Castle in northeast England. 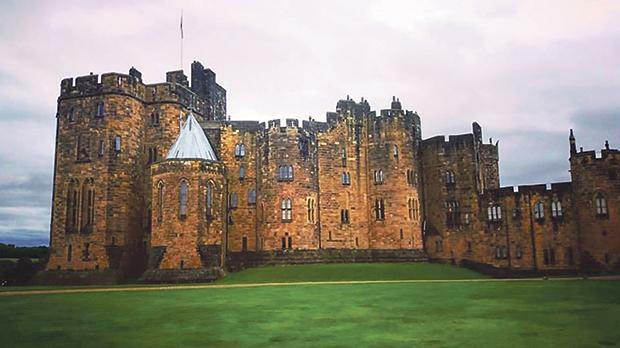 I must admit that when I first visited Alnwick Castle, my main motivation for going was the fact that it was one of the main castles used to portray Hogwarts School of Witchcraft and Wizardry in the Harry Potter movies. Fandom apart, I love exploring castles whenever I’m abroad and while reading about the various historical attractions one can find in Northumberland, of which there are many, Alnwick caught my attention for many reasons. Originally built during the 11th century, Alnwick Castle is the second largest inhabited castle in England being the seat of the Duke of Northumberland, who with his family, actively occupies part of the castle to this day. While trying not to buy too many souvenirs at the gift shop, right after we had purchased our tickets, I was amazed as I looked through the free visitor’s map and pamphlet they had given us, realising how much we had to explore. Although the castle itself was enormous (all the different parts were labelled in a diagram), the gardens seemed almost to dwarf it, featuring several differently themed sections formally landscaped around a central water cascade. The pamphlet promised a bamboo maze, a large wooden tree house, a number of water fountains and features, a cherry-tree orchard complete with tree-swings, a deer park and many other attractions which I couldn’t wait to see, however what really piqued my interest as soon as I read the sinister-sounding title on the tiny map, was ‘The Poison Garden’. After asking about it at the gift shop, I was told that this garden was always kept under lock and key, due to the dangerous plants and flowers growing inside and that one could only enter with an official guide at various prescribed times. Fortunately, the next guided tour was scheduled to start within 15 minutes, so off we went to find the entrance. The cloudy sky and intermittent rain seemed to be the perfect foil for such a grisly tour and as we waited in front of the iron-wrought gate with a number of other visitors huddling underneath rain-jackets and umbrellas, I couldn’t help but wonder at the giant lock and painted skulls warning us off. Finally, a lady with a jolly smile greeted us, cautioning us against touching anything within the garden once we were inside. This, she said, was because every tree, plant, leaf and flower inside was highly poisonous, not only through ingestion but even through touch. The gate was opened and we filed in slowly, only to have it clang shut behind us and padlocked once more. Every tree, plant, leaf and flower inside the garden is highly poisonous. The first thing we saw as we shivered in the rain and waited for the guide to start explaining the different plants to us, was a large black coffin. Smiling, our guide told us that even though it was not Halloween, that coffin was always there as a warning and to further set the stage for a number of macabre stories relating to the venom-filled bulbs, roots and plants found inside. The use of poison dates back as far as spiritual and mythical beliefs have been recorded. Our ancestors knew much about the power of plants. They knew not only which parts of the plants were poisonous, but also what quantities to use to kill, cure, drug, or relieve pain. The multicoloured trees, shrubs and flowers within the Poison Garden glittered sensuously with rain-drops as we made our way around them while hearing stories about their various uses and the gruesome incidents and murders caused by the plants, which had been historically documented. The pretty blue flowers of Monkshood, also known as Wolf’s Bane, had been used to poison enemy water supplies during times of war in ancient Europe and Asia, which caused numbness of the throat, intense vomiting, diarrhoea, muscular weakness, spasms, paralysis of the respiratory system, and convulsions which could be fatal. Yet another innocuous-looking shrub was revealed by our guide to be ‘wormwood’, which is one of the ingredients used to make Absinthe. Sporting tiny yellow flowers, wormwood is both a hallucinogenic and an emetic, it is in fact banned in most countries. Although the ancients knew how to use herbs and plants to heal, it was very easy to misconstrue their dosage or use, thus resulting in a number of ailments and deaths. Belladonna, also known as deadly nightshade, is well-known today to be made of foliage and berries which are highly toxic, however Venetian ladies used the juice from this plant as a cosmetic. It was, in fact, distilled as eye drops with the aim of enlarging and darkening the pupils, making the eyes look larger and more mysterious, hence the name ‘bella donna’ which means ‘beautiful woman’ in Italian. The guide told us that the poison in this pant is so effusive, that just three of its tiny sweet-tasting shining black berries are enough to kill an infant. Our guide also explained that many of the poisonous plants found within the garden at Alnwick grow avidly in the wild and can be erroneously ingested by a pet or child left unsupervised. Even the common daffodil, that is the narcissus, can be poisonous, since the bulbs contain toxic alkaloids. As we walked even deeper into the garden, I noticed that one small section in particular was dramatically cordoned off with chains. Seeing me looking at it in undisguised curiosity, the guide smiled and showed us the small sign at its edge. This in fact, was the ‘illegal drug’ section. 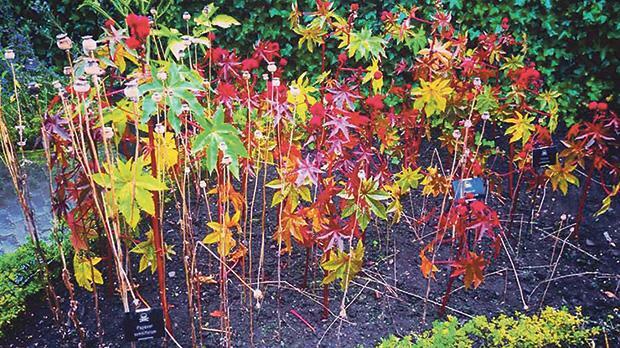 The Poison Garden at Alnwick was often a site for teachers and parents to bring students and children, in order to educate and caution them on drug abuse and the misuse of illegal substances. She assiduously pointed out that all the illegal plants found in this part of the garden, such as marijuana (cannabis) which is a hallucinogen and cocaine, which causes nose ulcers, convulsions and depression, among other effects, were grown with express permission from the government under a Home Office licence. Other commonly-found poisonous plants we saw and discussed during our visit included bluebells and snowdrops, whose bulbs are very poisonous when ingested and which can cause nausea, diarrhoea and vomiting. There was also common Juniper, whose berries can be fatal in small amounts; prickly lettuce, which is a sedative and can be addictive; oleander, which is highly toxic and may cause skin irritation if touched, and death if eaten; the opium poppy, which is a source of morphine, laudanum and heroin; and the tobacco plant, whose nicotine effects are well known. In other words, if you find yourself walking along a wild garden or forest, be very careful what you smell, touch, or put in your mouth, because even though something may seem pretty and innocuous, appearances can be deceiving! By the way, this article was originally published by the Maltese newspaper The Sunday Times, however due to a bug embedded in the webpage concerned, I am told that I am unable to share it in any browser for now, which is why I am resorting to my blog. Update: the bug has been cleared and any shares have been restored… ugh what a mess! Not gonna delete this entry from my blog now anyways. So there! I’m writing this while waiting for my better half to shower. We’re in France on holiday. I usually don’t have much time to write while on vacation, apart from writing personal observations in my travel journal, however I missed writing, so I decided to turn a bit to my blog now, since I have the time. I was randomly remembering an old article I had replied to some time ago. Someone was asking advice on whether she should prioritize either her family or her partner, since they did not get along well together. I guess most people would reply that family are there to stay while partners come and go. Thing is, I don’t think about it that way. Of course, the best thing is always to try and find a way for everyone to at least be civil to one another, especially if these are all people you care about. However, one thing one always has to remember is that it is a fact that no one gets to choose his/her own family. Family is something that willy nilly, you are born into. Rather like work colleagues. You just find them there and can’t choose them based on likes and dislikes, on their kindness or a nice personality. A partner on the other hand, is someone you choose to spend your life with out of all other possible choices and after growing up as a person and learning what and who you actually want in your life (unless you’re desperate to get married before you’re 35 or something, in which case as long as the person’s not a serial killer, anyone will do. Lol). So, moral of the story, with a partner you go into something with your eyes wide open and because you choose to, not because that’s how things got played out. In the long run of course, be they family-members, partners, friends, or whatever, any kind of relationship can fizzle out. People drift apart, change, or plain out decide they want different persons in their lives, and one cannot take anything or anyone for granted. Thing is, as long as it’s all about choice, it is important to prioritize those who, through their actions and behavior show that for them you are a priority in real fact. So, there you have it. It is important to know who you are, what you want from life, and who you want to share it with, because in the end, time is finite, and it is the most precious thing we have. And remember, real life is not lived on social media. It is not about how many likes you get, it is not about people’s approval, not about appearances and not about money. Real life is about making the most out of every day, learning and growing as a person, and most of all, it is about love, art, and personal evolution. Have you visited the Picasso Exhibition in Valletta? I love travelling. That is kind of obvious to anyone who knows me or who follows my articles or blog-posts. However, that being said, and travelling apart, first and foremost it is important to know and appreciate the beautiful and significant places within your own country, before venturing farther away. Which is why I also love to just explore all the many architectural and historical, not to mention natural wonders in Malta, the island I live in. A few weeks ago, me and my boyfriend decided to grab the bus to Valletta, Malta’s capital city, instead of using the car as usual, and make a kind of adventure out of our excursion. I take the bus almost every day coming back from work, but my boyfriend never does, so venturing to Valletta in this way with him was fun as I felt as though I was seeing everything for the first time with his eyes somehow. It was a very special date, as we went somewhere quiet exceptional – to view the Pablo Picasso’s sketches which are being exhibited in Valletta right now. Following Antonio Banderas’ work-related visit to our islands while he was working on the set for the forthcoming National Geographic Season 2 of the T.V series ‘Genius’, and portraying the great artist Pablo Picasso, a large number of the Spanish painter’s actual paintings are currently on exhibit in our shores. More specifically, the exhibition is taking place at the Grandmaster’s Palace, in Saint George Square Valletta. It opened its doors on the 7th of April and will be available to the general public until the 30th of June. This exhibition is part of a major international project titled ‘Picasso-Méditerranée’, an initiative from Musée National Picasso in Paris held between Spring 2017 and Spring 2019. In fact, not only will more than 100 of Picasso’s works be on exhibit, but so will a number of the artworks pertaining to the Spanish artist Joan Miró – the painter, sculptor and ceramicist born in Barcelona. The exhibition, entitled ‘Picasso and Miró: The Flesh and the Spirit’, aims at bringing the public closer to the perception of two artistic creators who shook the foundation of traditional art. The exhibition consists of a selection of 100 etchings from the Collection Suite Vollard which belongs to Fundación Mapfre and 40 paintings by Miro belonging to the Espacio Miró exhibition in Madrid. Fundación Mapfre is bringing this exhibition to Malta in collaboration with the Office of the President of Malta and Fondazzjoni Patrimonju Malti (FPM). The two artists’ work was paired together because of the similarities that run through their style and creative process. This is the first exhibition of Picasso and Miro in Malta and perhaps of any modern painter of this stature. Pablo Picasso and Joan Miro are two of the 20th century’s most influential artists. While the first founded cubism, the second was active in the emergence of surrealism. Following the exhibition, we roamed around Valletta and finally found a cute British pub and restaurant where to have lunch. A couple of beers were the perfect foil for such a day! If you want to read more about Picasso and Miro’s exhibition, take a look at the article which I subsequently wrote for LivingInMalta magazine, here. Some of the info I wrote in this blogpost in fact comes from my article itself, but I urge you to visit the magazine for the whole thing. It has been said that the way you treat and take care of an animal is a direct indication of the way you treat and communicate with human beings. Unfortunately, there are many people who mistreat and have no idea about how to behave towards animals, let alone the human beings around them! If you really love animals and want one to love unconditionally, his pedigree/how much he’s ‘worth’/where he comes from, shouldn’t matter. Don’t bring a pet into your home if all you want is fodder for social media ‘likes’, or to appear ‘cool’, or different. Better to adopt a dog or a cat who has no one to love him and care for him, rather than buy one from a breeder who, most probably, will be taken care of anyways. In this regard, there are many options to look at in Malta, and many cute animals in need of help, love and attention. To name but a few organisations and NGOs who take care of such strays, there’s the AAA (Association for Abandoned Animals), Noah’s Arc, The Island Sanctuary, the MSPCA and many more, since unfortunately, there are many such abandoned animals in Malta. BEFORE deciding to take another household member, it is imperative for you to take stock of your financial situation. Seems like common sense doesn’t it? And yet some people take in one dog, then another, then a third, and then a fourth, before they realize that ‘oh look, the dent in our budget is too big and we cannot afford this – let’s let some of the dogs go’. Don’t be selfish. Be an adult. Think about how you will finance your family before you increase it (and this goes for people who decide to have kids too actually). If you are adopting a dog, cat or another pet to love and care for, money is surely not the most important thing you need to have. Some time ago, a friend asked me why me and my partner do not have any animals in our home since we love them a lot. My reply was that since we are out of the house for 8 – 10 hours almost every day, not to mention the fact that we love to travel and do so randomly 5 – 8 times a year, it would be very selfish of us to adopt a pet, only to pour it into someone else’s lap whenever we decided to go abroad. Not to mention the fact that he would end up spending more than three-quarters of his life alone! And all this for what? So that we could cuddle him a couple of hours every day? So that we could have someone waiting for us at home when we got back? Some people actually do use pets in this manner. It may be because they are lonely, or because they are sad, because they live alone, or because they feel like they have no friends. They sign up for the responsibility of pets, when in the long run all they want is something to fill in the emptiness of their lives, even though this would mean that the dog or cat got to live most of his life alone in an empty house. THIS is selfishness. And what about those who abandon their pets when they decide to relocate to a new and more expensive house? Again, ‘because we don’t want our new furniture to be ruined’? Wow, that’s love for you! Ugh! If one decides to be responsible for a pet, that should be for life. You can’t chuck a cat/dog out of your house simply because you realize his presence has become ‘inconvenient’. Would you do that if you had a child and suddenly realized that playing mummy or daddy was not what you thought it would be? So, yes, I feel very strongly about this subject, because I genuinely love animals and always have. Ever since I was little, no animal of mine has ever lived in a cage, and I hate leashes with a passion. Currently, I realize that it wouldn’t be fair to bring an animal to live with me and my partner because our lifestyle simply means that we cannot give any pet the necessary time and attention he would deserve, so instead of selfishly getting one anyways, we just don’t. Some people would say that at least if you adopt a dog, he’d be living cozily in your home instead of with a multitude of other strays at a sanctuary – but then again, better for said dog to be adopted from the sanctuary by a loving family who can actually spend quality time with him and take him out rather than him spending his days alone in an empty house. After all, this is what love is all about. Thinking of the other, instead of only about yourself. Which is why, coming back to the argument I mentioned at the beginning of the article, I truly believe that the way you treat your pets, shows the way you also treat people. If all you think about is yourself, then there is no actual relationship to speak of, be it a dog or a human being. Pets, unfortunately, don’t have the mental faculties or physical capacity to open the front door and walk out of your life if they are fed up with your selfish behavior. Humans do. Natural history can be defined as being ‘the study of natural objects… the study of plants, animals, and sometimes ancient human civilizations’ (Merriam Webster Dictionary). This encompasses scientific research, but is not limited to it, being an ever-evolving discipline stemming back from the studies of Aristotle and other philosophers in the ancient world, continuing during the Middle Ages, and being further defined with the onset of scientific biology and disciplines such as zoology, palaeontology, botany and geology, amongst others. In Malta, those interested in learning more about our islands’ origins and local natural history, can visit the National Museum of Natural History located in the old fortified medieval city of Mdina, that is the old capital city of Malta, which is situated in the Northern region of Malta. This museum is to be found within Vilhena Palace, also known as the Magisterial Palace of Justice or Palazzo Pretoria. This is a French-Baroque 18th century building named after Grand Master Antonio Manoel de Vilhen, who originally commissioned it. The Palace was further used as a temporary hospital during a cholera outbreak in the 19th century and converted into a sanatorium by the British military during the 20th century. The sanatorium was closed in 1956, after which the Palace was opened to the public hosting Malta’s National Natural Museum, in 1973. The collections exhibited at the National Museum of Natural History include samples of flora and fauna, fossils, rocks, minerals, and dioramas of Maltese habitats. Display areas within the museum cover topics such as Maltese geology and palaeontology, exotic mammals, marine fauna, insects, shells and birds and other topics like human evolution. One hall focuses on the skeletal anatomy of vertebrates, one is dedicated to birds of the Maltese cliff habitat, and one shows the diversity of animals that frequent valleys. Another interesting display highlights the ecological importance of the islands of Filfla, Fungus Rock, St. Paul’s and Comino. The national bird; the Blue Rock Thrush (il-Merill), and the national plant of Malta; the Maltese Centaury (Widnet il-Baħar) are focused upon in a special section of the museum. There is also a reference library on natural sciences with over 4,000 titles mainly dedicated to the eighteenth and nineteenth century publications. The museum also houses historically important collections with over 10,000 rocks, 3,500 birds, 200 mammals, eggs and nests, over 200 types of fish, thousands of shells and insects from Malta and abroad and a very impressive fossils collection. The current display not only covers insects, birds and habitats but also human evolution and the marine ecosystem. Whether you are a local, or a tourist, there are many reasons to visit the National Museum of Natural History. Apart from the educational value inherent in the exhibitions, with interesting features covering various aspects of Maltese wildlife, the impressive Baroque style of the Palace itself is more than enough to make such a visit worthwhile. The Museum can be found at: Vilhena Palace, Saint Publius Square, Mdina, and it opens for the public from Monday to Sunday, from 9.00am to 5.00pm. Obviously, taking my interest in castles into account, I couldn’t NOT visit Sicily, one of my favorite vacation-spots, without also exploring a number of castles and palaces there. There are many beautiful Castles in Sicily, some of which I’ve already written about, such as the Castle of Venere in Erice (been there twice) or the Castle of Castelmola, however this time round, during my last trip to Sicily I visited a Castle which is less well known, though no less amazing. The last castle I visited in Sicily, is in fact also the largest to be found on this Mediterranean island, that is, the Castle and Citadel of Milazzo. Found in the small town of Milazzo, in the southern part of Sicily, the Castle is resplendently obvious as it is situated on a hill, majestically lording it over the nearby countryside and port. When we arrived, the local old guy selling tickets immediately befriended us and launched into the history of the castle, boasting about it as though it was his own home. He told us how the site itself had first been fortified in the Neolithic era, then manned by the Greeks, and later conquered and enlarged by the Normans, the Romans, and later the Aragonese (Spanish). Actually, it’s me the guy latched on to, since my boyfriend does not understand Italian, however I obviously couldn’t stand there bantering all day, so we excused ourselves and went into the castle itself. And it was HUGE. First of all, let me be clear, when I say ‘castle’, I mean the whole citadel of course, that is the castle, grounds, and surrounding buildings. The grounds are quite big, though overgrown with local plants and wild flowers, which was part of their charm. There was an old but well kept church sporting some crumbling frescoes, as well as a number of buildings hosting a museum, a children’s area, and a number of rooms dedicated to the Second World War. The real wonder of the site however were the medieval ramparts, where one could delightfully gaze at the spectacular panorama of town, port, sea, and countryside simultaneously. 360 degrees of paradise! For the travelling-amateur, Sicily usually consists of Mount Etna, the town of Catania, Palermo, Siracusa, Erice and maybe Taormina. Some even make an effort and throw in Castelmola. All these places are worth visiting (I have been there too and am saying that from personal experience of course), however the secret about Sicily is that the more beautiful, mysterious and historically precious spots are actually not so popular as you might think. Which is, of course, part of their charm. Having been to Sicily around 4 or 5 times during the past 5 years, I must admit that each time I visit, I fall in love with this island more and more. The more one explores and finds new places, the more one realizes that one has seen nothing yet! Take my last vacation there for example. There were a number of astonishingly amazing places we visited, but I’m only going to write about one in this post, as there is so much to write and describe about each of them. ‘Le Gole dell’Alcantara’, or the Alcantara Gorge, is situated in Alcantara Valley in Western Sicily. This natural canyon holds a jewel of a river, which gurgling and crystal clear, has sculptured and formed the surrounding hill for millions of years. The stone formations present in the gorge itself are indeed natural works of art tailored by mother nature. Coincidentally some time before, I had watched the movie ‘The Shape of Water’, and while the film itself has nothing at all to do with this place, or anywhere like it, I couldn’t help but think that the phrase itself, ‘the shape of water’ described the gorge perfectly, as one could definitely see the paths that the river-water had taken and forged into the rock itself. The Gole dell’Alcantara are as such not so popular as other ‘touristy’ attractions, even if they ARE set in a very well-managed tourist park full of flowers and plants, an orchard and ‘family-friendly’ facilities. This is kind of perfect for those who wish for some peace and quite, while at the same time don’t want to go somewhere completely without any sign of human habitation. We visited the Alcantara Park in March, that is, what I call pre-Spring. The weather was perfect, a tiny bit chilly, yet so sunny as to make one want to strip and just fall into the cool welcoming arms of the Alcantara stream. Unfortunately, this is only available for swimming in summer, so it was not possible, yet we were also aware that there would be more people visiting it later on in the year, so we much preferred to bask in its glory before that. The park itself, apart from the natural wonder that is the Gorge, contains a number of themed and styled gardens, many orange trees, a number of meandering walks with beautiful views, as well as a good canteen and playground for children. You could definitely spend from half a day to a full-day relaxing here. Not to be missed! Places to visit for FREE in Malta! When people start thinking about going abroad on vacation, one of the first things they generally ask about, is whether the country they are interested in is ‘expensive’ or not. What they are referring to of course, is not the normal cost of living, since they will probably only be there for a week or two at the most, but whether tickets to interesting places and/or events are worth it, how much can dinner cost, and whether you have to break the bank every time you go out, if you really want to enjoy yourself. Fortunately, many natural attractions and amazing places and events in our islands are either free of charge, or else very cheap to visit. Where you go and what you do depends, of course, on your own personal inclinations and preferences, however I feel quite safe in saying that there are places which no one can but appreciate. 1. Go to the beach – whether it’s summer, spring, winter or fall, Maltese beaches are always there free to be enjoyed by anyone. You can swim, snorkel, jog, have a picnic (making sure to take any litter with you), or even just enjoy a quick coffee while you look at the waves and meditate. No costs involved. 2. Visit the fish market at Marsaxlokk – taking place each Sunday morning, the Marsaxlokk market, though most famous for its freshly caught fish, offers many other treasures to be found by the intrepid explorer, within its quirky traditional stalls which meander around Marsaxlokk Bay. This is an open-air market, and therefore free to visit. Beware however, although most items are quite cheap, you may find yourself buying more than you bargained for! 3. Stroll around Valletta – rich in Baroque architecture, medieval heritage and photo opportunities, Valletta is perfect for those who wish to ‘look around’ without having to buy anything. Admire the Grand Harbor from the Upper Barrakka Gardens, visit Saint John’s Co-Cathedral and gawk at its artistic masterpieces, and take a look at the newly restored Triton’s Fountain. During 2018, Valletta is hosting the Valletta 2018 European Capital of Culture, which basically means that there are a myriad of free exhibitions, events, and open-air performances taking place around the city almost every week. Definitely not to be missed. 4. Explore San Anton Gardens – if you have children, or just love animals, this is surely the place to go. San Anton Gardens are located in central Attard and form part of the Presidential Palace. This beautiful very well kept botanic garden, houses both flora and fauna, and is interspersed with fountains, walkways, ponds and cosy corners. A very pretty place to go if you want to get away from the hustle and bustle of city-life. 5. Trekking – instead of spending money on a gym membership, why don’t you walk or hike while exploring the beautiful Maltese countryside? Whether it be Fomm ir-Riħ on Malta’s Western Coast, Dingli Cliffs situated in the Northern region, the South-eastern Delimara Peninsula or Għasri Valley in Gozo, the islands of Malta offer a vast array of natural places where one can stop and breathe the fresh air while taking a relaxing walk, or a more energetic jog. 6. Nightlife – During the summer, the Maltese islands flourish with the onset of weekly village festas dedicated to different patron saints and showing off the best of what traditional Malta has to offer. The fireworks, the night markets, the stalls, the entertainment, is all free, though of course once you smell a whiff of those freshly baked pastizzi, you’ll probably be tempted to open your wallet (don’t worry, this street food is quite cheap). In winter there are usually no festas, however there’s always Carnival in February and Easter in April, which always include a number of open-air evening activities. There are also a huge number of ‘Wine-fests’, and fairs focusing on particular products pertaining to specific localities throughout the year, such as the ‘Bread Festival’ in Qormi, the Pumpkin Festival in Manikata, the Chocolate Festival in Ħamrun or the Strawberry Festival in Mġarr. In case you hadn’t noticed, the Maltese do love their food! This article was written by me and originally featured on the magazine LivingInMalta here. Social Media – Fake or Not? Encounters with film, books, music, food and travel - welcome to my world! To observe, to be enchanted, and to enjoy the simple stuff in life, is truly a delight. A book blog with a generous slice of cake.